Dubai, 06 December 2018: Following an overwhelming response to the first edition of Golden Mile Galleria’s ‘A Cultural Flair’ festival last weekend, the event returns from 7 to 8 December. The festival brings together an eclectic group of artists, musicians, painters, sculptors and dancers under one roof to celebrate creativity, and engage with the community through various forms of artistic expression. Held on the terraces of Golden Mile Galleria on Palm Jumeirah, adjacent to Al Ittihad Park, the event presents two creative elements: the Africa Cultural Pavilion and Art Nights. The Africa Cultural Pavilion showcases the rich heritage of West and East Africa. Enjoy live Afrobeats, Jazz, R&B and Hip Hop music performances, or participate in Soco and Kupe traditional dance sessions. A fashion bazaar and handicrafts market is exhibiting African fabrics, accessories and home decor items, while runway shows feature designs by top UAE-based African fashion designers. Guests can also have their hair styled into twists or dreads at turban tying workshops, or attend bracelet making and wire sculpting sessions. An exhibition inspired by the continent’s culture will showcase artwork, photographs and installations by artists, while a learning and creative space will offer a collection of books about African heritage. Visitors can also attend panel discussions to enrich their knowledge about contemporary Africa. The Africa Cultural Pavilion is being held in collaboration with the Ajala Project, a UAE based award-winning social enterprise that uses art to raise awareness and crowdfund for social causes. Browse through artwork and discover inspiring stories of people creating a positive change in the world, or purchase a limited edition jacket. All proceeds will go a safe home for under-privileged girls in Kenya. 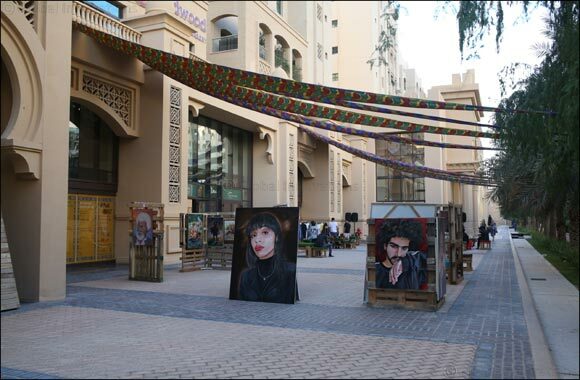 Art Nights feature established and upcoming artists in the UAE as a platform to interact with the local community. Occupying the spotlight is a giant sculpture, which guests will be invited to paint to create a community artwork. Muralists, graffiti artists and spray painters will also create colourful installations. Bonny Matthews, a self-taught, award-winning painter with artwork displayed at galleries in Vietnam and Italy. Other well-known artists showcasing their work include Ruba Badwan, Swena Harneja, Robyn Chislett, Linda Lipace, Sumedha Randev, Sharmila Tulpule, Ahmed Al Falasi, Shahul Kollengode and Busardoh Art.